The Shorty Bull is a compact and muscular bulldog of small stature. The head is round with typical bulldog features. Eyes are set far apart and should not protrude. Jaw should be curved, not straight. Nose should be turned up slightly and may be black or liver colored. Dudley noses are a cosmetic fault. Should have an undershot bite, but not excessively undershot. The eyes may be any color, although brown is the preferred eye color. The ears are cropped or dropped. Rose or erect ears are considered a fault. The body should be short from the back of the neck to the tail. The chest should be broad for height and have depth reaching to the elbow. A compact look is desired. The width of the front quarters and hindquarters should be proportionate, not lending to a narrow rear, and the chest may be broader than the rear. Very narrow hindquarters are considered a fault. The shoulders and rump should be well rounded and well-muscled, lending to an appearance of strength. There may be a slight rise over the loins. The legs are heavy boned and in direct proportion to the body. Long legs in proportion to the body or fine bones are a fault. Cow-hocked or pigeon-toed is a fault. The dog should have tight feet and straight pasterns. Splayed feet are a fault. The tail is short, either docked or screwed. All coat colors accepted except merle or black and tan. The Shorty Bull is a good-natured, even-tempered, stable dog. This breed needs leadership and will not thrive without it. When it senses an owner is meek or passive toward it, it will become fairly willful. These dogs respond best to an owner who is calm, but firm, consistent and patient. Proper human to canine communication is essential. Very willing to please. Makes a great companion and is ready and willing to work. Height: 15 inches (38 cm) and under. Weight: 40 pounds (18 kg) and under. The Shorty Bull does best living indoors close to its family. The Shorty Bull is more agile and athletic than the English Bulldog. It needs to be taken for a daily long walk where it is heeling beside or behind the person holding the lead, as in a dog's mind the leader leads the way, and that leader needs to be the human. Very little grooming is needed. Regular brushings will do. This breed is an average shedder. The founders of the Shorty Bull are Jamie Sweet and Amy Krogman. 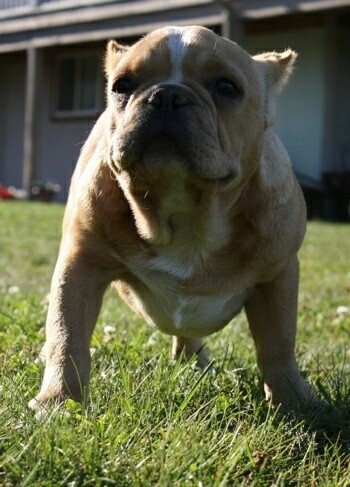 The Shorty Bull is a new line of bulldogs that are being bred in the miniature size. Unlike a lot of other bully breeds bred down in size, the Shorty Bulldog does not contain Boston Terrier or Pug in its lines. These dogs are being bred for their working ability and physical traits and not solely on looks.